The Deluxe Limited Edition is offered as a signed and numbered edition of 100 with 30 artist proof (AP) and 15 Hors Commerce (HC) copies. Housed in a clamshell box with book well and elegant ribbon pull, it is accompanied by an inner folio with two signed and numbered 11×14 original photographs made by the artist. The first is a toned silver gelatin print of “Point Pleasant Funhouse” from the series Afterlife; the second is a pigment print of “Sponge-Bob” from the series Transmogrify. This Deluxe Limited Edition will be in stock sometime in May/June 2017 and begins at $1000. You can secure $300 savings now with the pre-publication price of $700 by concluding your purchase before its expected delivery date in May/June 2017. 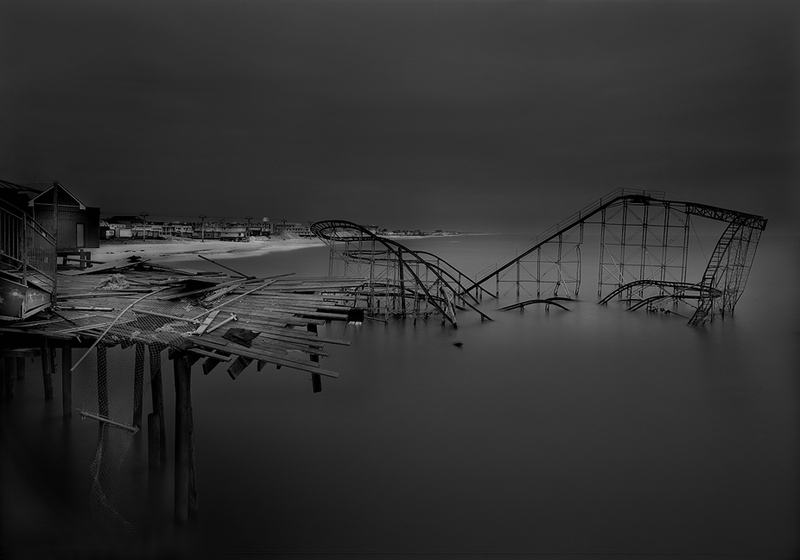 Here’s a preview of Michael Massaia’s next show “Afterlife 2013” featuring images from the Jersey shore – before and after Sandy. The photographs are split toned silver gelatin contact prints and gold platinum prints. Michael has just won the Hearst 8×10 award with a photograph from his “Seeing the Black Dog” portfolio of work. In the world of photography, this is a very prestigious award. It was chosen as one of the eight winning bodies of work from all fifty states, 2400 entries and 78 different countries. The judges are composed of the most respected photographers, gallerist and experts in photography. Many have asked how Michael Massaia shoots his amazing photographs. 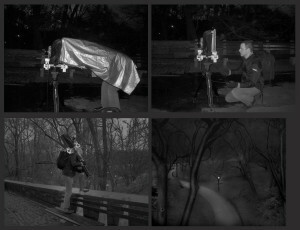 Here’s a series of images that shows Michael and his “Frankencamera” on location in Central Park. We’ve posted several of Michael latest images on the Gallery 270 Facebook page. These images from the Jersey shore were taken in the aftermath of Super Storm Sandy. Michael’s work is on display at Gallery 270 at Bergen County Camera in Westwood, NJ. Take a look at Michael Massaia’s previous Gallery 270 shows. We wanted our Gallery 270 at Bergen County Camera friends to be among the first to see this compelling image of The Casino Pier that Michael just photographed November 10th! It’s leaves me just speechless. This is such a achingly beautiful shot and an instant icon of documentary photography. We already have a framed print at our Westwood location, this man does not stop! 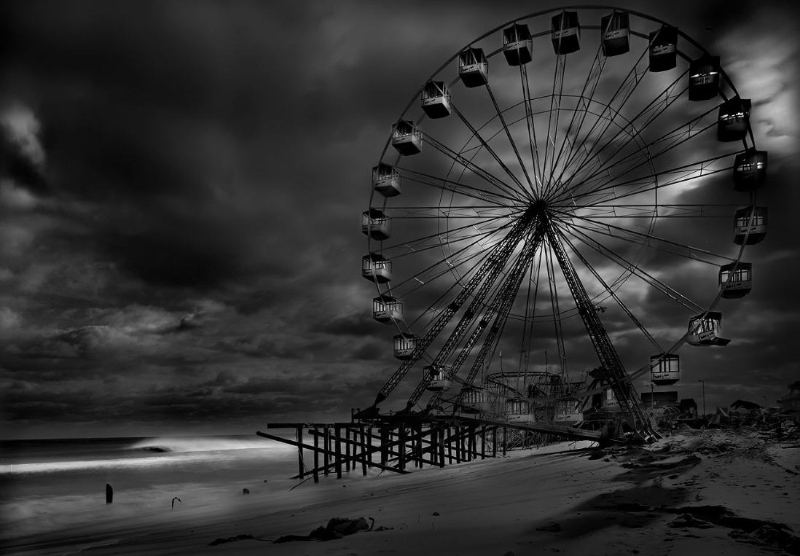 Michael hand his family have lived in Seaside Heights for decades and one of his first bodies of work documented the Boardwalk attractions now devastated by the hurricane. Martial law is currently in effect in the town of Seaside Heights. Michael only managed to get permission to do this shot only since he was there already assisting his uncle on his house. No one else will ever be able to capture this image, and no one could ever imbue it with more sensitivity and resonance. Looking into this compelling image midpoint at the extreme left side of the photo, the painted spotlights of “The Music Express” ride that Michael first immortalized in 2009, are all that remains. It is a stark reminder of a storm that devastated anything in its’ path. Gallery 270 at Bergen County Camera artist Michael Massaia was interviewed on the WPIX Morning news on September 22. The interview is a great look at Michael’s unique printing style which will be on display at the expo. 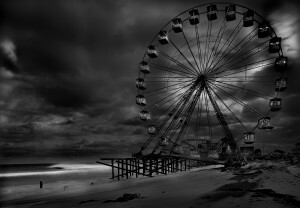 Michael will be in the Gallery section of the NJ Photo Expo this Sunday at the Park Ridge Marriott. Free tickets are still available.